The Seychelles is an archipelago of 115 islands set in the Indian Ocean 900 miles east of Kenya. The beauty of its beaches is known worldwide – idyllic ribbons of soft white sand lapped by turquoise waters and fringing jungle-covered hills and huge rocky cliffs. The ocean waters are over-flowing with tropical fish and turtles – perfect for diving, snorkeling sea kayaking, swimming, sailing and more. Other soft adventure activities include rock climbing, zip-lining, and trekking. The Seychelles is for honeymooners and lovers of water activities. This is a place to get away from it all for a few days – or weeks. There is a choice of resorts, accessible by small plane flights or boats from the international airport in Mahe. The Seychelles can be a destination itself, or a relaxing add-on stop to an African or Indian journey. Lakani World Tours can create a travel itinerary best suited for you – depending on your time, interests, and budget. The choice of Seychelles island depends on your interests as well as budget. Here is a brief description of what you can find on the main islands. Mahé – crowned by towering 3000-foot granite peaks, Mahé offers a treasure trove of flora. It is famous for its beaches, especially Anse Royal which is great for snorkeling. The town of Victoria has an eclectic culture and colorful bustling markets. Take a full day marine safari to explore the Sainte Anne Marine Park – sail, cruise in a semi-submersible vessel, feed tropical fish, and meet the Giant Tortoises that roam free. Explore Mahé’s untouched north coast on a guided hike through the Morne Seychelles National Park. Walk along a palm-fringed path that meanders above the rocky coast. You can also explore lush forest, tea plantations and savor some wonderful native Creole cuisine. Praslin – the second largest island with soft white sand and crystal-clear waters. Its Anse Lazio beach is considered one of the best in the world. Legendary Vallee de Mai, a UNESCO World Heritage Site, is home to a prehistoric rainforest of huge Coco de Mer trees and the rare Seychelles Black Parrot. This was once believed to be the original site of the Garden of Eden. Praslin is also a gateway to the smaller outer island – reachable by helicopter or day cruises. La Digue – Only 3 miles long this small island offers calm, shallow water and beaches accessible only by foot. La Digue’s diverse wildlife can be seen in its Veuve Nature Reserve. Visit the quaint and picturesque harbor and La Passe village with its Créole architecture, and historical sites such as L’Union Estate and the Copra Mill. Relish time on Anse Source d’Argent –the most photographed beach in the world –magnificent granitic boulders set beside white sands and crystal-clear waters. La Digue can also be a day-trip from Praslin, taking the short ferry or helicopter ride. The Outer Islands are smaller, more exclusive and more remote, most with boutique or castaway retreats. These include North Island – powder-white sands and wild turtle filled turquoise waters of the Ile Du Nord eco-reserve. Félicité island –dramatically beautiful with massive granite boulders fringing the shoreline and perfect beaches. Fregate Island – a private playground with great diving, birding, and beaches. Cousin Island – a beautiful nature reserve and pristine ecosystem that hosts some of Seychelles rarest birds. Curieuse Island National Marine Park – a unique island eco-system accessed on twisting walking trails through the mangrove swamps, dotted with giant crabs and a breeding population of Giant Tortoises. 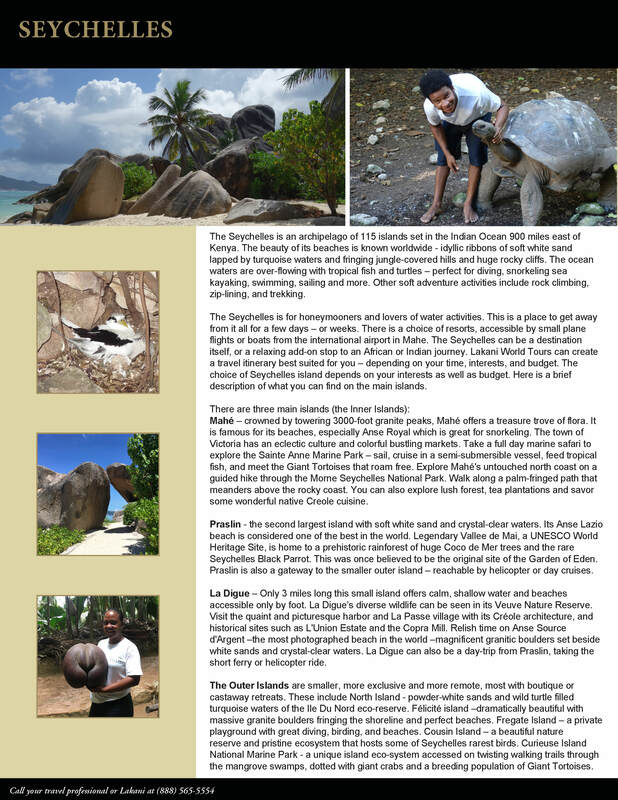 See the 3,000-foot granite peaks, exotic flora, and Giant Tortoises of Mahé. Visit Praslin and search for the rare Seychelles Black Parrot as you wander a prehistoric rainforest of huge Coco de Mer trees. Relax on Anse Source d’Argent, one of the most photographed beaches in the world. Enjoy the powder-white sands and wild turtle filled turquoise waters of the Ile Du Nord eco-reserve.